The list of members below only shows those members that are permitted and want to be listed. If you want your details listed then please ensure that you have met all of the necessary requirements for the organization and then check that the ‘Show me in the Breeder List’ option is checked in your profile. If you do not see the option there beneath the Password reset button, then you will need to Contact Us. The breeder’s list below can be searched by entering terms in the search box. Each term is required in the list entry for it to be displayed. The map shows the locations of our members, but their contact details will only be displayed (when you click on the location) if they have chosen to be listed on this page. If you want to be sure you are getting a pure guinea hog, buy from a reputable breeder who is an AGHA member. Do not accept the animal without proper documentation. Piglets from a registered litter must show the permanent registration number on the AGHA form given to you. Any application to register a piglet or hog whose litter was not previously registered must have the parentage and their registration numbers listed on the form. Ask if the breeder if he/she is a member of the American Guinea Hog Association. Specifically ask if the boar and sow are AGHA registered. Our members abide by a Code of Ethics in dealing with the public and fellow breeders. Click on the map above to view a map of AGHA members. Thriftiness is our number one concern for all the animals on our farm. That's why we got started with AGH 3 years ago. We fell in love with this breed for its easy-going temperament and delicious, moist, and tender meat. Now, we have invested in good breeding stock and have vowed to do our part to keep this amazing breed of homestead hogs alive and thriving. Our matriarch, HDF [Queen] Victoria, is descended from the recently saved Sumrall MS line. She has a long, well balanced frame with straight legs, level back, and a smooth, even gait. She's very docile, an excellent forager, and attentive mother. Our patriarch, FF Prince Albert, is a stout, thick bodied boar with large hams. Eager and effective at performing his duty, he and Victoria have produced a fantastic first litter and we're very excited to watch them grow! We are a homestead located in North Carolina. WSBK (est. 1993) is a small farmstead in the Florida Big Bend area which is home to eight adult AGHs some "bacon bits" born March 2018, about 60 chicken, several horses, multiple barn cats and several dogs. ---------- Of the adult purebred AGHs, one boar is registered, all four sows are also registered. We also have an unregistered boar and two AGH barrows (for our own Camp Freezer). Now that we have established our ability to handle, breed and birth this breed, we are ready to begin a carefully planned breeding program of only registered AGHs. ---------- As of 23 March 2018, we tripled our current herd size with the birth of our first homegrown litter (3 boys, 3 girls) out of the unregistered boar and one of the two sows going partly back to the Sumrall herd. The other sow provided us with another unregistered litter of 7 on 23 March 2018 (4 boys, 3 girls). 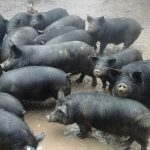 While we plan on keeping the first litter and grow them out for our own food supply, the second litter will be available for purchase as meat hogs. Please contact us if you are interested in any of those upcoming piglets. ---------- We are committed to the future of the breed and hope to contribute significantly by moving to AGHA registered stock only by the end of 2018. Ionia Farm is in Northeast Nebraska real close to the South Dakota border. Our breeding stock includes three sows and one Boar. We are in love with this breed and would love to share this love with others who are interested in this unique breed of hogs. We also raise goats and other heritage breeds of animals. Please contact us via email with any questions. Spring piglets will be available soon! I was raised on a farm with livestock. I have recently had the opportunity to raise livestock again and wanted to get guinea hogs. I find they are very smart and docile. My grandchildren love having them around. 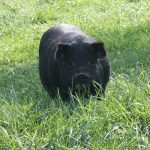 I'm looking to sell breeding stock, as of now I have six boars an two guilts full blooded breeding stock available, some of them already named and registered. We have a small farm in kokomo indiana. We have piglets 2 times a year. We are Earths Blessing Farm and Have been raising hogs for about ten years, but have just gotten into Guinea Hogs this year (2017). Cottonwood Acres is a small family farm focused on natural and sustainable practices. We love our adorable little Guinea Hogs for their great personality, delicious meat, lard, and grazing abilities. How do you beat turning kitchen scraps into bacon? By no means do we know it all but we are more than happy to answer questions and host visitors to see our homestead operation. I’m the owner of HallowedAcres Farm.We are located in Woodbury Georgia. We have American Guinea Hogs (Sumrall Bloodline). Our pigs are raised on pasture and feed non GMO feeds. We breed to improve genetics and are working with the genetic recovery program for the Sumrall bloodline. Our original stock came from Broad River Pastures. We now have both registerable and non registered piglets available in June. Text 719-200-5900 for more information. Our Guinea Hogs are the homesteader’s Golden Grail of Hogdom. We live at 9000 ft in the mountains of Colorado. These wonderful, friendly, cold tolerant critters round out our homestead of chickens, bees and gardens. Five Acre Farm located in Northeast Kansas specialized in All Natural American Guinea Hog husbandry. Please contact us for high quality meat and genetics. When my husband and I retired from the Army we began to piece together a little farm in Southern Illinois. My research led us the heritage breeds, and so to the American Guinea Hogs. We got our first little gal in 2009 and instantly fell in love with the breed. We raise and sell breeding hogs, butchering hogs, and occasionally pairs of hogs destined to live in someones barnyard eating mice, turning over compost piles and entertaining families. Small sustainable farm in SE Wisconsin. Focus on rotational pasture & natural systems for small livestock & poultry. Introduced to AGH by Laura Dykstra in 2016. Currently working with blue line. 1 reg boar, Sahib; 6 reg sows & gilts. Prefer shorter snout, longer body. We have been raising pigs for 25+ years and switched to guinea hogs about 8 years ago. We love guinea hogs and Love to talk about them so if you have any questions or would just like to discuss AGH, feel free to contact me! late Spring Litter! All males will be cut unless you contact us about a boar purchase ahead of time! Very gentle boars from Donar! Restoration Ridge is located outside of Clear Lake Washington. Our Guineas run on pasture with chickens all year. We have one boar (Cultus from Baylis Samson lines) and are breeding Guinea Hogs to work to improving grow out and finishing size/time. We have guineas at all stages and typically have 2-4 litters per year. Registered American Guinea Hogs ( blue and black varieties), Fine-fleeced Shetland Sheep, Miniature Dairy Goats, Sebastapol & Pomeranian Geese, Maran, American Breese & German New Hampshire Chickens. My homestead is located in South Central Kansas. 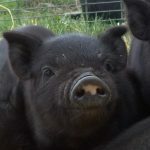 I have a registered boar and sow, with unregistered (but pure AGH) feeder barrows and butcher hogs regularly available. My AGH's are raised on pasture, hay in the winter and are fed an organic hog feed. I chose the AGH because I wanted a heritage breed hog that I could process on my own, was generally good natured, was able to forage for some of their food and was hardy. My line of AGH's are hairy, short legged, root very little and run on the small side. Our boar is not much over 250lbs. At this time I do not have any available breeding stock, but plan on a summer litter. We are a small homeschooling homestead in Garden Prairie, IL where we have been raising AGH for two years now. Our herd is currently ten hogs with one sow and one boar, but do to our love of delicious pork have plans to breed a second sow this summer. Theses friendly, easy going pigs have won our hearts. Our family farm focuses on sustainable practices and the ethics of Permaculture. We are currently raising American Guinea Hogs and cattle on pasture. You can find us on Facebook https://www.facebook.com/pg/emeraldalefarms/about/?ref=page_internal. We raise American guinea hogs on pasture and through the woods. We feed non-gmo locally produced feed and let pigs be pigs. We constantly strive for the best pigs, and only a select few are allowed to become breeders, all the others become the best pork available. We are Daniel & Nina West. We own Danina Farms located in Rutledge, Ga. We have been raising American Guinea Hogs for almost 2 years. Our starter breeding stock came from Broad River Pastures. On our farm, we use sustainable and chemical-free practices in raising our livestock. Our herd of hogs are raised humanely on pastures with plenty of room to forage and be hogs. We are a small farm with woodlots and pastures and clean drinking water that houses our registered boar and two sows. This year, we have increased our numbers to include two registered gilts that are available for sale, and about a dozen meat piglets. Our goal is to grow our own meat and offer meat piglets to a handful of other people wishing to enjoy this wonderful pork. As our piglets develop, we select one or two for registration if they appear to exceed the expectations of this wonderful breed. We chose a hobbit theme eight years ago when we bought this northeast Nebraska farm--Guinea hogs are perfect for this place and for that theme! Small family farm located on Fidalgo Island, just outside Anacortes, WA. We have been raising AGH for a few years as well as raising meat and laying chickens and turkeys. Our homestead, Barefoot Acres, is nestled in the middle of Kauffman's Fruit Farm, my family's orchard. You can find us on Facebook @barefootacresfarm. Our goal is to raise at least two litters of registered piglets per year. We currently have piglets for sale from two litters. Feel free to email if you're interested in purchasing any piglets. SRR is the home of Almost Heaven American Guinea Hogs in central WV. We have 2 registered gilts for sale out of rare Sumrall genetics. 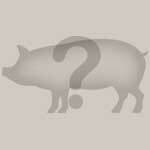 In March a registered, proven boar and sow pair will be available. Sow may be bred to a different boar if interested. Expecting litters of registered piglets in March and April. Please visit our Facebook page for more info and photos. We began several years ago with heritage chickens and Champagne D'Argent rabbits. In 2017 we added AGH to the farm. We had our first litters summer 2018. Our hogs enjoy walnuts from our farm along with pasture, pumpkins, garden produce, BOSS, and supplemental feed. With Premier One fencing we rotate them frequently, moving from our front yard out to one of the fields. We are a small farm raising rare livestock to improve existing numbers and to preserve heritage breeds. We raise American Guinea Hogs and Jersey Giant Chickens. Our goal is to provide our community with sustainability of pure and healthy food and breed stock. KB Farms is a small farm with AGH in various stages. Our hogs are pasture raised and all natural. We are located in Finksburg, Maryland. We currently have feeder pigs available. Please contact me for more information. We are a retired mailman and an long-time farm-girl. Over the years of hobby farming, the name Leep-At Farm has been on Ayrshire cattle, Alpine goats, Dexter cattle, and since our first litter last year American Guinea Hogs. During the years our interests and needs have changed with our children (all adults now) growing, and assorted health issues. We like the AGH for the convenient size and ease of handling, ours will follow for a scoop of sunflower seeds (or be distracted if we need to do something in the pen without piggy "help"). Currently have 5 gilts (born April 19, '17, available for sale. We are a Family Homestead and farm where we raise American Guinea Hogs and free range chickens naturally. With our first baby on the way, this gentle breed of hogs is very important to us. The demeanor is unlike anything else we have experienced and we are enjoying selectively breeding our well-mannered AGHs in a way that showcases their illustrious pedigree. Raising livestock the way early Americans did...with little external inputs. Our AGH breeding program is based on thrift of the pig. We are committed to building breeding stock with distinct lineage that thrive. If ever not satisfied with your stock from us we'll happy replace it. Silverthorn Heritage Farms, is located in the Southern Appalachians of Western North Carolina, at an elevation of 4000'. We specialize in heritage farm breeds. Selling breeders & feeders. We also have a blacksmith shop and a retail store, " The Homesteading Supply Co." , with a emphasis on education, in self-sufficiency & homesteading. Now in college, I was born and raised on our farm. I chose to be different from my older siblings and raise pigs rather than ruminants. The docile temperament and smaller size of AGHs makes them fun to raise and not scary like my earlier commercial hogs. We brought our first breeding pair home in 2015. We sell the best pigs for breeding stock, being careful to have positive identification and accurate complete records for registration, and to procure health certificates if needed depending on destination. Our pork customers rave about the tasty meat! We sell the whole, live animal and deliver it to the locker nearby to be processed. Small homestead, we have goat, registered guinea hogs and chickens. Havens Homestead is nestled in a valley of the Arbuckle Mountains of Oklahoma. Don't blink or you'll miss them. We started our homestead journey with chickens and turkeys, but quickly moved on to American Guinea Hogs. We've had these remarkable animals close to seven years now and have never looked back. We are honored to be a part of the guinea hog recovery from critically endangered to now on the watch list! We normally always have unregistered but pure feeder piglets available. We have a waiting list for whole and half orders if you are wanting to try the best pork you've ever had! Generally, we will have registered breeding gilts available. I take reservations for registered boars and will pick the best of the litter to remain intact. Our herd consists of: Pepper, the matriarch sow who is from the first litter born on our farm. Harley Quinn, an oops mama who has turned out to be so fantastic she has stayed with us as a breeder. Diana, Harley's sister and even better mother; fierce in the protection of her babies from predators. She's the first one to greet you at the gate and loves to be pet. Hank McCoy, is our new boar. He's still young and unproven but is a sweet boy and a CHUNK...which has earned him the nickname Hank the Tank. He is from blue lines and we're watching closely to see if he will turn blue or produce blue offspring! We have traveled and worked to procure diverse genetic lines in our herd to provide quality breeding stock for all needs. We have feeders of various age ranges as well has hogs ready or near ready for slaughter. We are a small hobby farm raising AGH since 2010. Our breeding focus is on the stewardship of the nearly 100 year old Sumrall herd genetics. Nearly decimated in the 2000's, these guineas had not been mixed with any outside pigs in many years and retained their original primitive features, such as shaggy ears, semi turned up snouts, very short stature and broad hips and shoulders. They were outcrossed with other AGH lines to save the few that remained and we are now working to spread the genetics and restore their historic phenotype. Our other priority is stewardship of the last known descendent of Brown's Blue Boy, Maveric Esther, and carefully line breeding to bring out the rare blue genetic trait from Blue Boy whereby piglets are born blue (rather than born black and later turn blue). We have a small family farm in the Northern California Foothills. We raise pastured, organic heritage livestock, gardens and children. We currently have a registered AGH Boar, two sows and three piglets. Pioneer Pastures is a small farm located in the Birdsview/Concrete area of Washington. We have AGH pigs of varying ages, in addition to meat chickens and laying chickens. All of our animals are pasture raised in a rotational grazing fashion, and only fed organic/all natural foods to supplement. We utilize a holistic farming approach to the best of our ability. 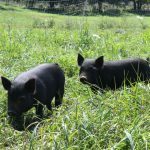 ** PIGLETS FOR SALE ** At the Old Crowe Farm we raise the American Guinea Hog since it was well suited to our 130-acre pasture-based sustainable farm environment. We sell very socialized, registered breeding stock, as well as feeder stock when available. We specialize in selling breeding pairs and trios and offer an AGH Mentoring Program at the farm (with B&B accommodations). Find us on Facebook. JoyfulNoiseHome-N-Stead.com is the home to American Guinea Hogs, St Croix Hair Sheep, and our family! We raise these wonderful rare pigs and sheep primarily for our own meat and also to provide quality breeding stock to others. We have piglets and lambs, proven breeding stock, and butcher-ready barrows available. Hello, we have been raising AGH hogs long enough to know we really like them. Our farm is focused on Spanish Meat goats but the hogs fit into our grazing program and help us be a little more diversified. We focus on animals that are hardy and true survivalist. They must be able to be good moms and easy keepers. Our animals must also benefit our farm with substance and sustainability. We also like the beauty of our animals in a natural setting. Cascade Meadows Farm, near Portland Oregon, helped rescue American Guinea Hogs from near extinction in 2005, and was the first to import the breed to the Western US. We have a broad range of AGH genetics and one of the largest and oldest herds in America. We select toward friendly, healthy, good growing AGH, with natural resistance to disease and parasites. We have helped hundreds of small farms get started with American Guinea Hogs and love sharing our extensive knowledge with others. We guarantee our pigs and provide ongoing advice and support. We almost always have breeding stock and feeder pigs available and we welcome visitors (with an appointment). We specialize in providing breeding pairs and trios. All our hogs are 100% purebred, registerable AGH. closertotheland.com - Raising AGHs in Chatham County, NC, since 2008. We're a veteran-owned, family farm that breeds for good temperaments, hardiness, sturdy conformation, mothering instincts, and adaptability. If humankind disappeared tomorrow, our hogs wouldn't just survive, they'd thrive. We cull hard and only register the best. Email us at moc.o1555620424ohay@1555620424dnale1555620424htotr1555620424esolc1555620424 to find out what we have available, or to set up a time to come meet the animals. Our hogs love visitors and we love educating people about this remarkable breed and the importance of regenerative agriculture. 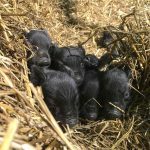 Piglets for sale in May-June, including breeding pairs. I began my AGH adventure in 2010 with the purchase of Skyfire Pete and Skyfire Pulp. My line of pigs is now #3HillPlace. I chose AGH because they are considered the historical breed of Southern homesteads. Sadly, Skyfire Pete is now deceased, but Skyfire Pulp lives on (and has been selected to be one of our DNA bank examples). Working with AGH since 2010. Focusing on breed preservation in AGH as well as heritage poultry. We are a small Hobby farm located in North Central Florida. We currently have two registered sows and a registered boar. We are focusing our breeding on maintaining the breed standards and a friendly temperament. We will occasionally have piglets for sale. We also raise a couple breeds of laying Chickens as well as several flocks of meat birds each year. Heritage breed hobbyist. First introduced to AGH in 2017. Breeding is focused on the Hester bloodline. Goal is to have 3 breeding groups, so as to have unrelated pairings available, but culled heavily for selection. Most are of the small boned type. Other animals include Highlands, Nigerian goats, turkeys, barnyard mix chickens(mainly Welsummers), Rouen ducks, rabbits. Our little piece of paradise is located in Western Pa. When we moved out of the city in 20156 our goal was to raise all our own food and AGH fit right into that plan. They are a great pig for the small scale homesteader, friendly and delicious! Never will we eat store bought pork again. We live on a small homestead and want to begin a herd of AGH. We also have Katahdin Sheep and various breeds of chickens. Crowover Farm is a smallholding in Ashburnham, MA. We raise American Guinea Hogs and currently (fall 2018) have 4 available piglets - 2 gilts and 2 boars - for sale and or trade. Looking for a breeding quality gilt; less related. Also a dozen or so assorted feeders. We strive to introduce AGH to the market so that our customers can discover the many fine attributes these animals possess. We currently have 3 males and 3 females for sale born litter was born august 23rd, please call for more info. My name is Dominic i am a young adult that used most of my savings to purchase 1 boar and two sows, these are my first registered heritage hogs. Now that i have had them for 2 years, I have experienced for myself these great animals are like a pet, due to there very friendly nature. I want to expand my herd and be able to offer piglets to others. We are a small farm, just getting started. We just had our first litter of American Guinea Hogs this year and can't wait to grow more! Our small farm is nestled in the Nehalem Valley surrounded by lush forests and a small orchard. We have one mating pair of Guinea hogs and hope to share their adorable offspring with you! They have been a joy to be around and I have been impressed with their easy going demeanor. We hope you can have the fun experience of this breed of pig too! We have a small ranch in Southwest TX. Our hogs free range on grass and also enjoy mesquite beans and leftover fruit from our orchard. We have piglets to 1 year olds. $75 to $200 All are Registerable. My husband and I have a small homestead. AGH’s are perfect for us. We just love them. We also breed goats for milk and meat as well as meat rabbits. The SSL Family Farm is a 25-acre farm in southeastern Michigan. We are homesteaders, providing our family with as much food as we can from our own land, as faithfully and sustainably as we can. We share our journey in hopes that we can help others create a sustainable journey of their own. Veteran owned and operated raising heritage breed stock and rare heirloom produce. American Guinea Hogs available, both registered breeding stock and unregistered butcher hogs. We are a large family with a small hobby farm. We grow our food making every attempt to function with an organic approach. We have two sows and one boar for breeding, and we had our very first litters in July of 2018. We raise pigs for breeding and for butcher. Homestead Heritage Farm based in the Upper Peninsula of Michigan. PIGLETS FOR SALE! At Hidden Spring Farm in Snow Camp, NC, we primarily raise the heritage breed of sheep, Leicester Longwools. In the past year, we have started raising American Guinea Hogs and find these heritage pigs to be very friendly and docile, great foragers and good mothers. We currently have both male and female piglets for sale, born 6/19/2018, Celesky, Oberdorfer, Holly Brothers, Setty, Krum lines. We have a small farm in Auburn, CA with AGH, mini Nubians and alpacas. We have a litter of AGH from registered stock that will be ready for new homes at the end of March! Bryan and Jenny are first generation farmers in the Upstate of South Carolina. We have three registered girls (one gilt and two sows) and one boar. All of our breeding AGH's are from top lineage. With every litter, we will register the best and the others will be listed as feeders. Our pigs work hard on the farm to clear land and provide the best fertilizer. We love this breed! Please check our website or email us with questions! We are a small hobby farm specializing in heritage breeds. Located in the Sacramento Mountains of New Mexico. My Wife and I live on a small family farm in Tavares FL. We are starting our herd of AGH in January of 2019. We have over 5 acres of lush grass pasture with plenty of peanut grass and Bermuda grass to rotate our herd on. We are focused on quality breeding and providing an excellent environment for our hogs to thrive. We believe in rotational grazing and keeping our hogs on fresh grass and providing organic feed. Welcome to Habby Valley Homestead! We are located in a beautiful little valley surrounded by cattle ranches just west of Gillette, Wyoming. We are a family of six...Nathan, Nicole, Ethan, Lillian, Wyatt, and Elli Darlene. Our family loves being out in God’s creation; enjoying all that He has created for us. We love camping, fishing, hunting, gardening, animals, and now homesteading. We currently have one registered AGH sow and her gilt piglets who will be registered as well. We will be adding a registered herd sire for Spring 2020 litters and plan to raise and sell piglets for ourselves and others. We will be adding Heritage Breed chickens as we continue to expand our homestead. Feel free to contact us if you have any questions. Aullwood Audubon Center and Farm is a working educational farm in Dayton, Ohio. We specialize in raising heritage breeds and educating the public on conservation.